A 2013 report indicated that 1.2 billion people play video games worldwide. That was three years ago. Games are everywhere, and you can see it whether you’re signed in on your Xbox One or fielding dozens of requests to play the latest game app with your friends on Facebook. Over one billion people are playing games, and it’s not one gender, or one race, or one age group that is exclusively responsible for these numbers. The same study showed that it was a 52% to 48% split of men to women playing games. Not everyone is playing, but all kinds of people are! Which brings us to AbleGamers. 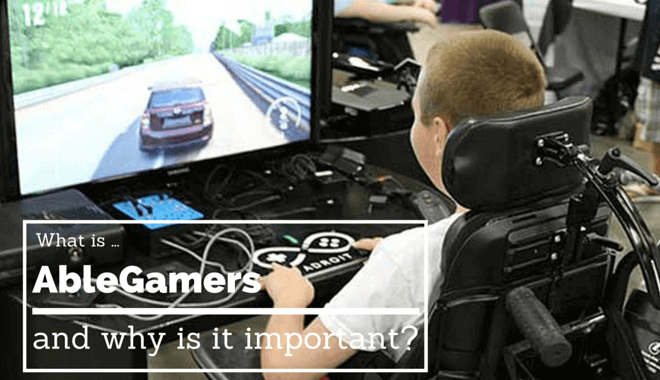 AbleGamers, according to its site, “is a nonprofit public charity that aims to improve the overall quality of life for those with disabilities through the power of video games.” It is an awesome thing. If you are a non-disabled gamer, you probably never think about the accessibility of games. You might adjust the difficulty setting every once in awhile when a particular boss is too challenging. Maybe you’re old school (like us) and love playing with an inverted Y axis. Maybe you like to reassign crouch to “B” to avoid having to click in the right thumbstick. These are fairly minor changes, in the grand scheme of the game. You do them without thinking twice about it. What about people with physical or cognitive disabilities? There are so many kinds of impairments, of all different gravities, that could make playing certain games a challenge. So, AbleGamers makes sure that video games are accessible to all gamers, especially those with disabilities. They do this in a number of ways. Which acts as an easy-to-follow, question-answering roadmap for developers looking to make sure their games are accessible to everyone. The foundation uses their Includification criteria to review as many games out there as they can, grading them based on the accessibility of the game. AbleGamers then lets their wonderful community know whether or not a game would be playable and/or enjoyable. Pretty awesome, right? Video games afford players an opportunity to experience things that they might not otherwise be able to experience; in some cases, this is especially true for disabled gamers. If you’re looking to get involved, there are a handful of ways you can do so. Donating to the foundation is one way. Over 90 cents on your dollar will be put towards helping the foundation. That is a great ratio for a nonprofit organization. If you aren’t looking to donate money, you can donate your time. You could reach out to become an includification game tester. You would be responsible for reviewing new titles and ranking them based on their accessibility. You’d be debriefed on what to look for in a game. They also take volunteers who are willing to submit content, or help set up fundraisers and other events. So many of us gamers take our ease of gaming for granted. It’s a wonderful thing to see such strong support for all-inclusiveness in gaming. What’s better than having a big chunk of the gaming community behind you?